McALLEN — As U.S. Customs and Border Protection officials deal with a change in policy regarding the detention of immigrant families due to lack of space, questions have arisen about the duration of time immigrant families have been detained. 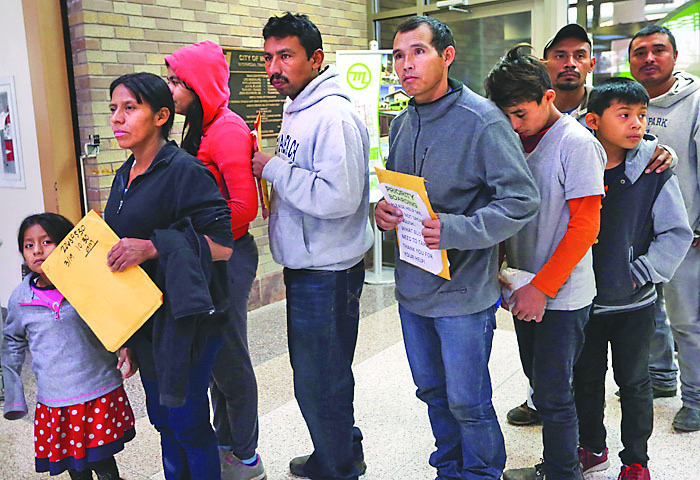 As many as 30 recently released immigrants, with legal paperwork in a bright manila folder kept close, waited Wednesday evening at the downtown bus terminal to hop on their respective buses on their way to relatives or other family somewhere away from the Rio Grande Valley. Citing a lack of space and the need to avoid potential risks to Border Patrol agents, CBP officials said just a day earlier that they had no choice but to begin releasing large groups of immigrant families. CBP officials maintain that the more than 200 percent increase in family apprehensions experienced this fiscal year, which is compared with the same four-month period last year, is leaving little choice but to opt for release; if only to make room for the next group of families. U.S. Department of Homeland Security officials notified lawmakers, city officials and local law enforcement agencies earlier this week that they are more than 2,000 persons over capacity at their respective facilities, leading to the change in how agents process immigrant families. In a collaborative effort with KRGV-TV, The Monitor on Tuesday and Wednesday surveyed the immigrants waiting at the bus station about their experiences. From a pool of 100, the length of detention ranged from one to 10 days before being dropped off at the McAllen respite center, which is operated by the Catholic Charities of the Rio Grande Valley. They were locked up in places referred to as La Hielera and La Perrera, which in English translates to the icebox and the dog cage, respectively. Under CBP regulations, the agency must transfer out of its custody any migrant, regardless of age, after 72 hours. The men and women who agreed to speak to The Monitor under the condition of anonymity hailed from Central American countries — Honduras, El Salvador and Guatemala. Some came with one child; some with two. As of the posting to this report CBP had not responded to calls and an email request for comment regarding immigrant family’s claims of being held past the 72-hour period. The men, women and children described the poor conditions and tight space available inside the facilities, confirming CBP officials’ announcement that a lack of space prompted them to release immigrants with a notice to appear, hoping that will alleviate some of the overcrowding they’re experiencing due to the increase in families turning themselves in at the U.S.-Mexico border. They described seeing buses picking up and dropping off people on a continuous basis, with groups being picked up every half hour to make room for even more groups that were arriving. Parents described the brutal cold of the McAllen detention center, where a foil “space blanket” was all they had to keep them warm. Astrid Dominguez, director for the ACLU Border Rights Center, reacted to the news of the releases earlier this week. Exacerbating problems for CBP is the recent news of the fourth migrant death since December. CBP confirmed the death of a 40-year-old Mexican national at an El Paso hospital on March 18, which was days after he was apprehended attempting to re-enter the country illegally, a CBP news release stated. It’s the fourth death of a migrant in CBP custody since December, which includes an 8-year-old boy and 7-year-old girl. On Feb. 18, a 45-year-old Mexican national died at a McAllen hospital two weeks after he was apprehended near Roma. These recent deaths and current overcapacity situation has led to more focus on CBP’s policy on duration of detention for migrants held in its custody. Ricky Garza, a staff attorney with the Texas Civil Rights Project, attended a protest held near the McAllen Border Patrol station during DHS Secretary Kristjen Nielsen’s visit to the Valley Thursday afternoon. “We don’t know whether this was all planned, but it definitely seems like a weird coincidence that we’ve seen the numbers of people released double and triple within a period of days,” he said. Garza — who has met with immigrant families also reporting long stays at CBP facilities, specifically through his own participation in interviewing those who end up in federal court — said he was concerned at the coincidence of Nielsen’s visit and the release of large groups of immigrant families happening within days of each other. Beginning two weeks ago, Garza said he and other TCRP attorneys and support staff began seeing a significant decrease in the number of people being referred for prosecution on immigration violations at the federal courthouse. Multiple attorneys working at the federal courthouse, who declined to comment on the record because they were unauthorized to speak to the media, confirmed Garza’s assertion. They noted that Border Patrol began sending fewer defendants for prosecution in recent weeks, with a total of about 100 for the entire week, last week. The decline is substantial compared to the number of defendants public defenders were seeing just a month ago, when attorneys in the federal public defender’s office were seeing nearly 150 defendants per day. Garza said the drop in defendants began about the same time TCRP officials began hearing about large groups being dropped off at the local respite centers. He said after making trips to the McAllen bus station, and speaking with the recently released immigrants, they were able to determine that a majority were being held longer than the three-day detention period. The attorney said the aforementioned instances point to clear violations of government guidelines as it relates to holding people in CBP custody. “…And it makes us suspicious why… ” Garza said. “… If the government is saying that there is an overcrowding problem in the facilities, why are people being held for a week — more than double the government’s own recommendation to hold people in centers that immigrants themselves call hieleras and perreras, or ice boxes and dog cages? The release of the immigrant families is also a week after President Trump vetoed lawmakers’ decision to deny him his national emergency declaration. Despite the violations, Garza said he and others who favor the rule of law want immigrants coming to this country seeking asylum to be allowed to do so, and not illegally held longer than prohibited. Earlier in the week, U.S. Rep. Vicente Gonzalez, D-McAllen, chastised the Trump administration, accusing them of manufacturing a crisis. Monitor staff writers Molly Smith and Daniel A. Flores contributed to this report.